Blood Capsules Completes your zombie and vampire costume, great for jokes, or the stage. 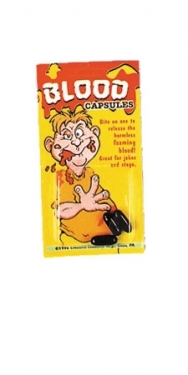 Includes: 3 faux blood filled capsules to create a realtic dripping blood look. Safe and non-toxic. Caution: Red pigment may stain skin, hair, and clothing.